The Allard’s racing notoriety came at the hands of individuals who are now legends in their own rights – Sydney Allard, Zora Arkus Duntov (Corvette pioneer), General Curtis LeMay (Commander of the Strategic Air Command), Carroll Shelby (entire 1953 season) and Steve McQueen. Chassis #3211 was one of only five cars issued with an Oldsmobile 371 CI engine and was purchased from the factory by Gines Arimany, for a Guatemalan General who raced the car in street races in Central America for several years. It came to the USA and was restored in 1977, taking prize winnings at Pebble Beach Concours, as well as 5 consecutive class wins at the Monterey Historics throughout the 1980s! The historically eligible car then participated in the 1987 Mille Miglia race in Italy with John Gorsline and Brian Redman driving. More recently, the car has participated in many famous rallies stateside such as the Colorado Grand. The Allard J2X was often called “THE BRUTE” and was the car to beat in the early days of sports car racing in the US. 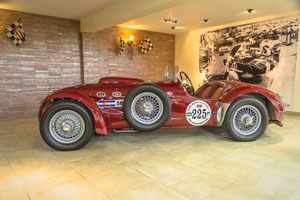 The Allard Formula of European chassis engineering with American power has become a classic combination leading the way to such notable cars as the AC 427 Cobra, the Sunbeam Tiger, and even the Pantera.